Samsung and Apple dominate the country with a combined market share of 71.2 percent. 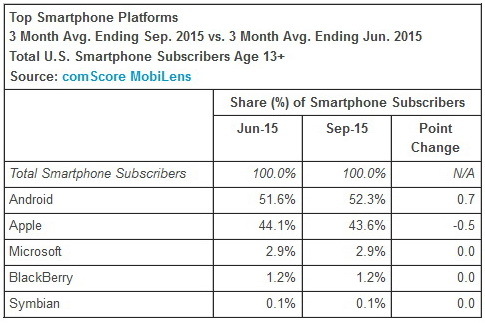 Analysts from comScore have revealed the top 5 smartphone manufacturers in the U.S. during the 3-month period ending September 2015. 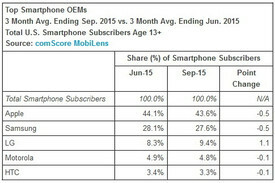 According to their data, Apple experienced a small decline of 0.5 percent for a market share of 43.6 percent. The Cupertino company is still the number 1 smartphone brand in the United States. 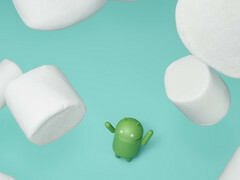 The next most popular is Samsung with 27.6 percent of the market (-0.5 percent), LG with 9.4 percent (+1.1 percent), Motorola with 4.8 percent (-0.1 percent), and HTC with 3.3 percent (-0.1 percent). Overall, comScore estimates a subscriber base of 192.4 million users corresponding to a market penetration of 77.4 percent in the U.S. during the 3-month period. As for smartphone operating systems, Google Android is still on top with 52.3 percent (+0.7 percent) of the market followed by iOS with 43.6 percent (-0.5 percent). 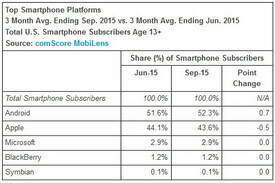 Microsoft Windows (2.9 percent), BlackBerry (1.2 percent), and Symbian (0.1 percent) round up the top 5. 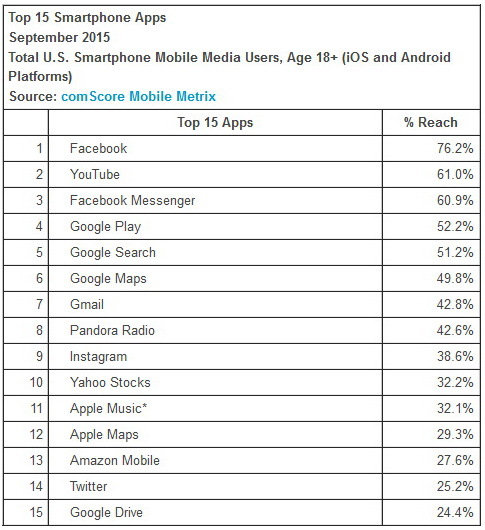 The most popular third-party application is Facebook with a reach of 76.2 percent followed by YouTube (61 percent) and Facebook Messenger (60.9 percent). 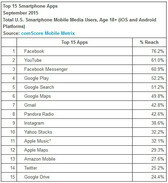 Google Play, Google Search, Google Maps, and Twitter also make appearances on the list of the top 15 applications.